You have drawn drawn the crossroads as your Single Love horoscope for tomorrow, Wednesday, April 24th. 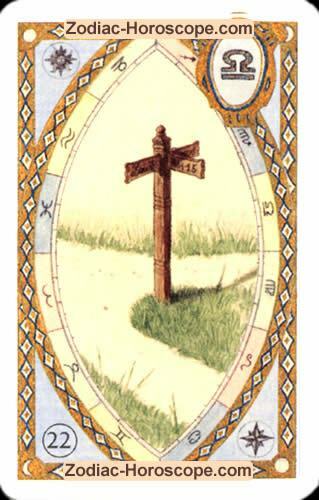 The crossroads is a neutral card, so the day tomorrow will also have a neutral tendency. It is the planet Venus which will influence you tomorrow. Tomorrow will be a day, you have to make a very important decision. Do not shirk, rethink the possibilities and consequences. You have the choice, either leave everything the same and bury your head in the sand, or finally make a change. The decision will be very difficult for you, but it is also very important for your future. Sometimes life is rich in variety! Tomorrow you will have the choice between two potential partners. The other will change his character within a few weeks and disappoint you. Listen to your heart and not to your friends and make the right choice! Circulatory problems can to come to you. You need to move your body more and eat more fruits and fresh vegetables. How do you like the daily astrological card? The average rating result is 7.92 of 10 stars.